Whaling: Is it still a problem? For those of you who did not know, we provide here an update on the International Whaling Commission ‘s work. The 59th International Whaling Commission (IWC) meeting was held in Anchorage, Alaska, from 28-31 May. Once again the outcome was disappointing. Pro-whaling countries failed to overturn the global ban on commercial whaling and the Japanese whaling fleet will again hunt over 1,000 whales in the Southern Ocean this year – including 50 threatened humpbacks and 50 endangered fin whales. The people of Australia, to secure the future for whales, must insist that the Australian government put the issue of commercial whaling on the agenda in its negotiations with Japan, along with trade and security. The IWC has agreed to a special meeting to discuss reform, but unless reform means a complete overhaul of the IWC’s original mission statement, The Dolphin Embassy recommends that the IWC be closed down and a new international organization be formed, under the auspices of the UN, to protect all ocean species, especially whales, dolphins, and porpoises. The end of killing must be the goal -- never lost sight of and always the outcome we pursue. 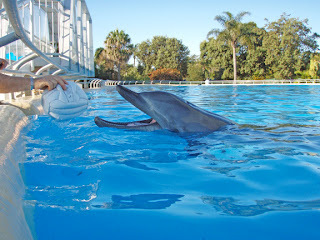 This week we had the pleasure of showing the popular Australian TV travel show Getaway our dolphin swim program. They contacted us several months ago and asked if they could film us. We said, "Of course!" They brought along Australian Olympic Gold Medal swimmer Gian Rooney as the guest presenter, and filmed for two days. We met them at the pool, with three friends who agreed to be "extras" and swim with the dolphins (we know, a hard job, but somebody had to do it), at 7 am. We had borrowed heavy wet suits from a local dive shop (Thank You, Jetty Dive Centre!) and were all suited up and ready to go. The water this time of year is chilly. Too chilly to actually do our swim program, which is all about health, wellbeing, and the joy of interacting with dolphins in a relaxed way. Chilly water is not conducive enough, for most people, to be able to enjoy their time in the water, so we do not run our program at this time of year. So, as with most TV, it was a bit fake, but with the dolphins, it was still quite real. We had so much fun, diving among them, swimming alongside, seeing them up close, touching them, feeling them wrap their flippers around us and give us a hug. Gian had a wonderful time, the director was very happy with the footage they got, the cameraman was smiling, and even the sound guy seemed to be happy. 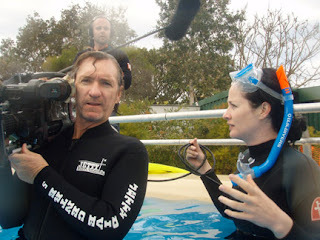 The entire crew, even the production assistant, all got in the water with us. We look forward to seeing the episode on which our segment will run, sometime later in the year (November?). It will be short, about 4 and a half minutes, but we are hopeful it will bring lots of attention to the wonderful opportunity we are offering -- to become friends with four amazing dolphins. Underwater, sound travels fast. Almost five times as fast as sound in air (4.7, to be exact). The speed of sound underwater is not the only factor that makes sound so important in the watery world. It is also a much more directly physical energy, one that has high impact. Decades ago a film made history, one of the first films to be shot underwater with high quality cameras. Shot and presented by Jacques Cousteau, it was called “The Silent World”. It captivated audiences around the world. I was among them, as a young lad, taken by my parents to a theatre that showed the unusual widescreen format that The Silent World was shown in. For all his expertise and “groundbreaking” inventions – the underwater breathing system called SCUBA, or Self-Contained Underwater Breathing Apparatus, and other innovations – Cousteau could not have gotten it more wrong. The Oceans are full of sound, and many of its lifeforms depend upon their sonic abilities for their survival. If we are to understand the challenges of the Cetacean Nations, the difficulties they face in their struggles for life, especially those that are “anthropogenic” (human caused) in nature, we must take into account the sonic pollution of the waters. The millions of years of evolution that the dolphins and whales have been through have adapted them well to the sounds of the natural seas. The snapping shrimp, the crackling of fish, the waves pounding against the shore, the hiss of wind across the surface – all these are normal sounds, ones that can be heard, or consciously ignored. Just as we have selective hearing, enabling us to carry on conversations in noisy clubs, and to hear our names amid the hubbub of a party, dolphins and whales can filter out unwanted sounds, to a degree. And yet, with the advent of modern technology, humans have been pouring high intensity sounds into the oceans in a deafening cascade. 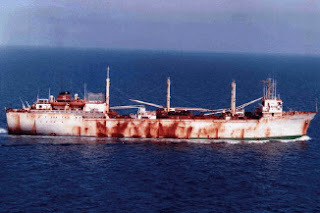 The modern supertanker is something few people have a real perspective on. Imagine a vessel capable of carrying as much petroleum as the United Kingdom and Spain use in one day, which is about 3.2 million barrels. 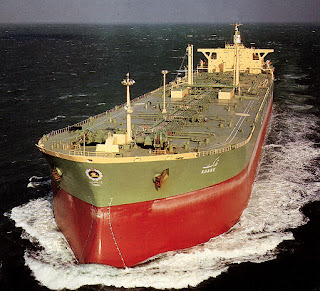 This is a ship that is considered to be a medium sized supertanker. This class of ship can take as many as 50 miles to stop. The momentum of so much mass is almost unimaginable. And oddly enough, these ships often use only one propeller. Navies around the world have studied and designed propellers to the nth degree. To avoid detection at sea, a ship must be silent. Propellers have been designed that could eliminate this single source of deadly sound…but they have not been adopted. There is no international oversight for sonic pollution in the oceans, so the deafening goes on, day and night. First, we must become aware of the problems. Then we can begin to address them. Now we know. Now we can begin to act. 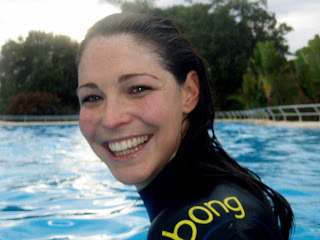 With our dolphin-swim program focused on enabling people to have unique levels of contact with dolphins, we have had an excellent opportunity to do research into the effects of dolphin contact. Working with Dr Hunter Handley, a local psychologist, we have done an extensive survey of the moods of our swimmers. Using a well-recognised psychological "instrument", called PANAS (Positive and Negative Affect Survey), we have asked our swim participants to rate a list of words that designate emotional states, or feelings, on a scale from 1 to 5, either of low significance up to high significance. This survey is done before the dolphin swim, immediately after the second swim, and again at a randomly chosen date, some weeks post swim. 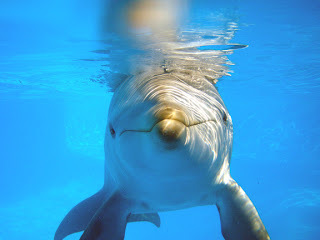 This enables us to get a reasonable look at the change in mood that occurs as a result of the dolphin encounter and its lasting effect. We had 68 people in our program this past season, with 52 of them eligible for our research program. So far, 35 have responded. We are almost complete, and expect 4 more responses. This gives us a fairly large sample and the results are very interesting. We will withhold reporting the final results for a while longer, until we have all the responses in hand. Our intention, working with Dr Handley, is to publish our results in a peer-reviewed journal. 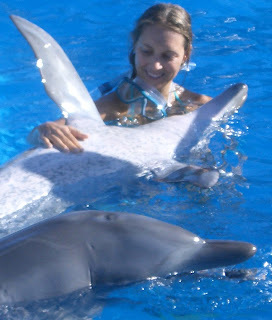 As a contribution to the field of Dolphin-Assisted Therapy research, this should be a significant paper. There have been few papers ever published in this promising field and we hope to improve that. Stay tuned for more information, the results of our research, and a link to the eventual location of the published paper. Thanks, Hunter, for all your hard work. It has been a pleasure working with you on this worthy project. We went for a short visit this afternoon, to see our friends, Buck, Zip, Calamity, and Bella. All were in good form, each doing something unique to show us they remember us. Zip came over and watched us, then, when I put a ball in the pool, he grabbed it and began offering it to me. He would push it toward me, then back away with his mouth open wide. I tossed it to him about 20 times, then began pushing it down under water and letting it go, so he could catch it. He seemed fascinated by this, giving it his full attention. A nice game, we played for another few minutes before he took the ball over to Amanda. Calamity came over, looked at me, slid onto the side of the pool with her face, and stopped still. She looked, then slid back into the water, and began a circuit of the pool. Bella had held back for a while, then began swimming alongside Calamity, doing the circuit. It was like old times, when Bella was tiny, a shadow under Calamity all the time. Then Bella decided to come close and gave both Amanda and me a kiss, putting her rostrum over the wall, holding still, while we bent over and kissed her. She gave us each one, then swam off. Amanda got the camera out (a small Olympus that can be used under water) and took some photos. Of course, Bella came over right away, to see what was happening, and since she loves cameras, posed for some nice shots. It was a nice visit. 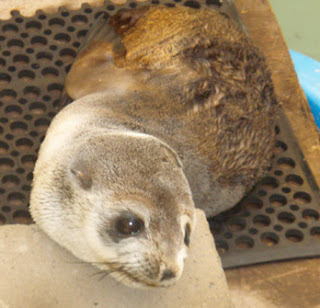 We learned that a small seal had been brought to the rescue facility only days ago, and we got a peek at it. So tiny, vulnerable looking. We hear it cannot be released, so it will become a resident somewhere, perhaps here in Coffs Harbour. A remarkable report has just been published detailing the illegal whaling activities of the Soviet Union in the years between 1955-1978. The information it is based on is impeccable: the actual reports of the whaling ships themselves, from a Russian government archive in Vladivostok, Russia. The reports document dramatic declines in abundance, disappearances of whales from previously populous feeding and breeding areas, and a continual decline in the average size and age of animals in the catch as the over-exploitation reached critical levels. Also recorded are the repeated warnings of the reports’ authors that the catch levels could not be sustained without severe damage to (or extirpation of) the populations concerned. However, it is apparent that all such warnings were routinely ignored by the Soviet authorities in their quest to meet high production targets." The era of Russian illegal whaling was one of terrible consequences. Despite the International Whaling Commissions attempts to curtail whaling, to make it sustainable, various nations and many illegal pirate whalers (notable among them was Aristotle Onassis, whose pirate whaling activities were among the worst) kept up the relentless slaughter. When the moratorium (def: a temporary cessation of activities) was finally put in place in the 1980s, it was too late. The affected whale populations were doomed, and still have made, in most species, little headway toward species survival. What have we done to Mother Ocean? It is time to take a good long look at what we have done, and begin to rethink our priorities. It is time to shape ourselves to meet the needs of the world, rather than endlessly expect the world to shape itself to our needs.